NEW: In a discrimination case that is almost unbelievable, legal representation is also preparing to sue the Kentucky State Police for an incident in Richmond, KY which has not been made public. Details will follow once the lawsuit has been prepared and filed (by the middle or next month at the latest). View the Equality Center Home Page for additional updates and information! These are the email arvhives of Kentucky Equality Federation and its coalition members known as the Commonwealth Equality Coalition. KENTUCKY EQUALITY FEDERATION JOIN OUR MAILING LIST BY SENDING A TEXT MESSAGE! 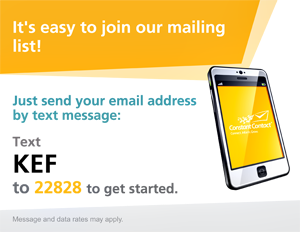 It's easy to join our official mailing list! Text: KEF to 22828 to get started!